More than 220 participants attended the world’s largest conference on Wood-Plastic Composites (WPC) and Natural Fiber Composites (NFC) . In December, more than 220 participants attended the world’s largest conference on Wood-Plastic Composites (WPC) and Natural Fiber Composites (NFC) which took place for the sixth time in Cologne, Germany. All presentations are now available here. A wide range of topics around the complete variety of biocomposites were presented by speakers from industry and R&D. While construction and automotive account for the biggest markets for WPC and NFC today, these materials also offer huge replacement potentials in plastics and composites beyond these more ‘traditional’ applications. Bio-based raw materials lead to local added value through innovative production processes and products, but require a great amount of know how for raw materials, processes, properties, recipes and application fields. The conference provided an up-to-date picture of different technologies and most promising applications. As always, the Wood and Natural Fiber Composite Award was an eagerly-awaited highlight of the conference. With a clear majority, the participants voted for a natural fiber-reinforced, 100% bio-based coffin made by ONORA BV from the Netherlands. Second place went also to the Netherlands (Millvision B.V.) for flower pots made of biodegradable biocomposite from agro rest fibers. The third place was awarded to a cellulose fiber-reinforced polystyrene for music instruments produced by a cooperation of the two Finnish companies Aqvacomp Oy and Flaxwood Oy. These composites and many more have the potential to replace plastics in consumer goods, as many experts predict. A lot has happened in the field of biocomposites since the first WPC & NFC Conference took place ten years ago. Good reason for Dr. Hans Korte from Dr. Hans Korte Innovationsberatung Holz & Fasern, Wismar, to summarize the technical developments in the field of WPC and biocomposites since the end of the 1990ies. For the last two decades, the German WPC market has been growing continuously, as was reported by Dr. Peter Sauerwein from the Association of the German Wood-Based Panel Industry (VHI). An analysis of commercially available European decking samples was presented by Dr. Andreas Haider from Wood K plus, Austria. Some products in the market show an overall better performance compared to 2008 – in particular regarding water absorbance and colour fading but also regarding the mechanical properties. Dr. Wayne Song, WPCC (Wood-Plastic Composite Council of China) presented the latest market news and trends in the Chinese market. He focused especially on interior walls, whose market shares have not been growing as strongly as had been predicted by Chinese representatives at previous conferences. Dr. Asta Partanen, project leader of the conference, presented the outline of status and future markets for bio-based composites in Europe until 2020. The talk provided insights into the new market and trend report, published in June 2015: Wood-Plastic Composites (WPC) and Natural Fiber Composites (NFC): European and Global Markets 2012 and Future Trends in Automotive and Construction. According to the study, the share of WPC and NFC in the total composite market – including glass, carbon, wood and Natural Fiber Composites – is already an impressive 15%. The production volume of WPC was 260,000 t in the EU in 2012, for NFC 92,000 t. The full study can be downloaded here. Another highlight was the trend in WPC and NFC granulates. So far, mainly small producers and traders offered WPC and NFC granulates with limited technical support and often missing data for simulations. But this has been changing since big global players introduced their new developed materials, such as Sustainable Lightweighting Thermoplastic Solutions for Automotives, presented by Marc Mézailles from PolyOne Global Engineered Materials (FR/USA). Developments in the use of bio-based polymers in the automotive industry were shown by Global Marketing Director Bio-plastics at Corbion Purac B.V. (NL), François de Bie, together with Francesca Brunori from Röchling Automotive SE & Co.KG (IT). They presented their latest cooperation results on high heat PLA 100% bio-based natural fiber filled compounds. Sustainable Lightweight Material in Automotive Industry: Simultaneous Back Injection Moulding of Natural Fiber Composites, was presented by Tayfun Buzkan and Motoki Maekawa from Toyota Boshoku Europe N.V. (DE / JP). The material performance fully meets automotive requirements and reduces production time. This story uses material from the WPC Conference organizers, with editorial changes made by Materials Today. The views expressed in this article do not necessarily represent those of Elsevier. TRB Lightweight Structures Ltd says that it has recently gained DIN 6701 type certification. 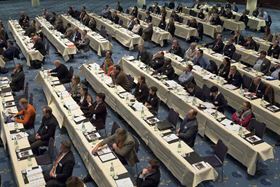 The Biocomposites Conference Cologne will reportedly be the largest industry meeting on biocomposites worldwide.